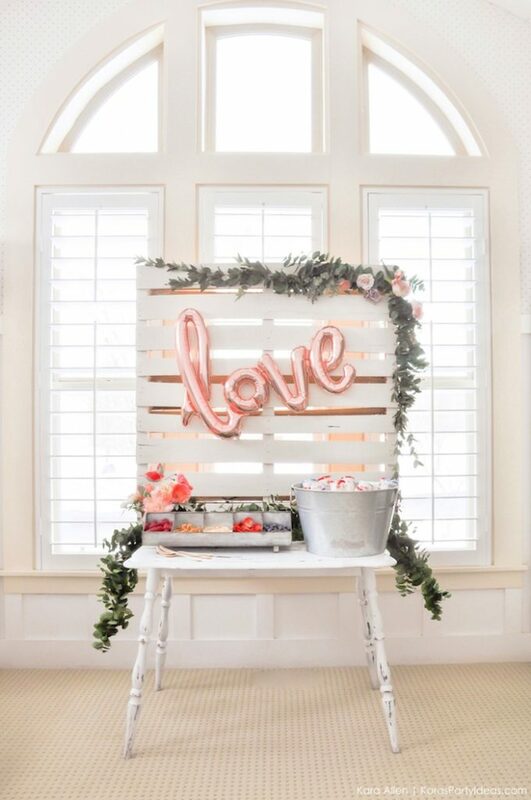 Sometimes it only takes a few basic elements to take a simple idea to a “Love”ly idea! 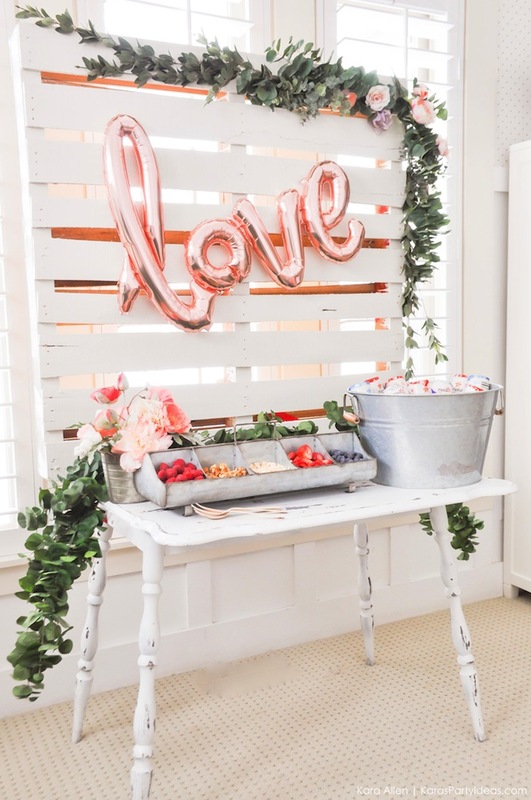 In this case, the basic elements of a painted pallet, some floral pieces, and letter balloons are used to create a fabulous YOPLAIT YOGURT BAR for a bridal shower (the idea could also be used for a baby shower or other celebration). 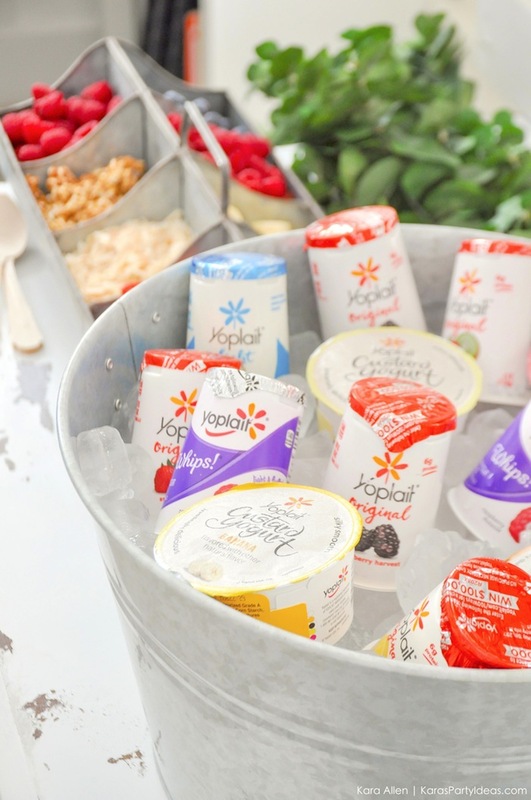 I’m so happy to be partnering with Yoplait again this year, and am so excited about their new products! Its a new year, and with that comes new goals. 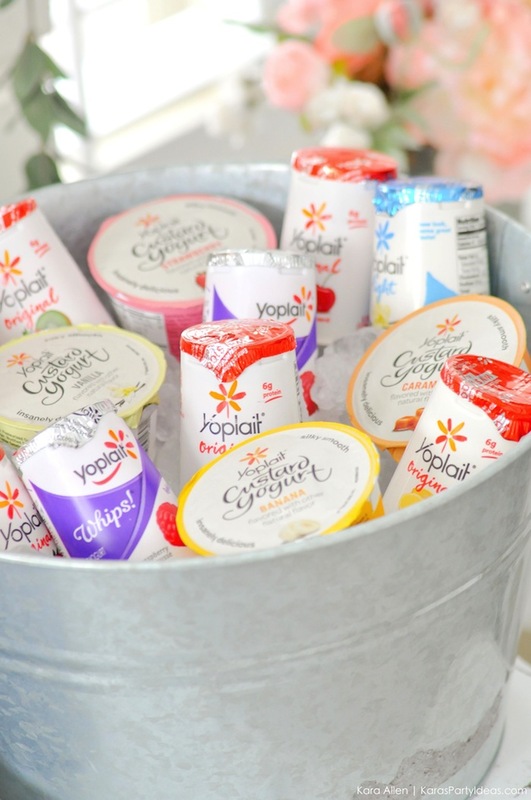 One of my new years goals is to be healthier & parties are always a danger zone, but with Yoplait I can do just that. 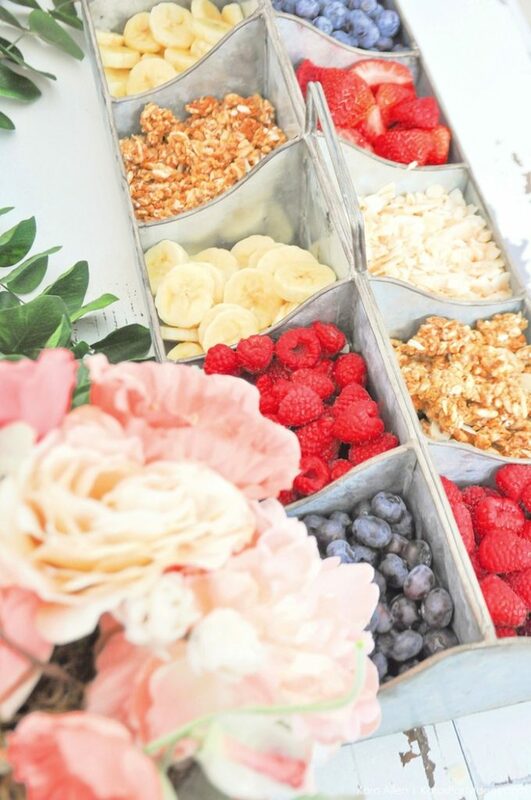 I created this yogurt bar as a pretty and healthy party menu for a bridal shower. I love that has no high fructose corn syrup, so my yogurt bar will not only taste great, but I can also feel good about serving up something a little healthier to my friends and family. A galvanized, sectioned container holds the yogurt-topping goodies – blueberries, strawberries, sliced bananas, raspberries, toasted coconut chips, and granola. 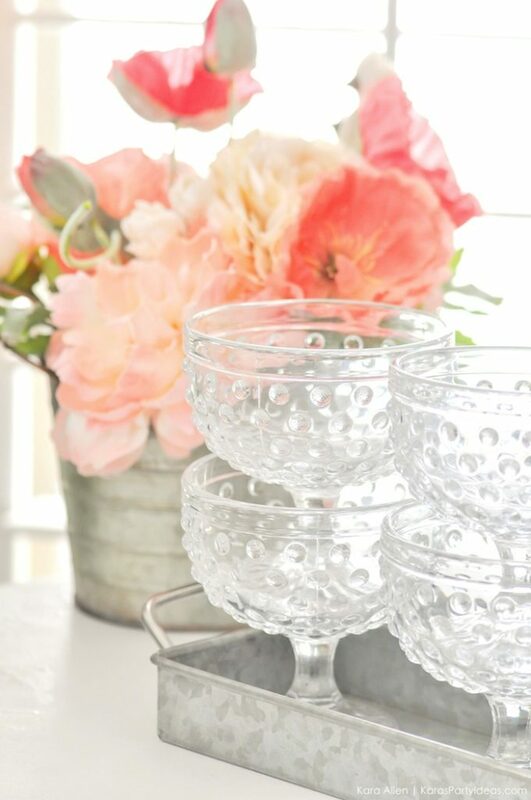 Glass parfait cups and wooden utensils sit at-the-ready for the yogurt creations. And the varied selection of yogurt sits on ice, waiting for the big debut. 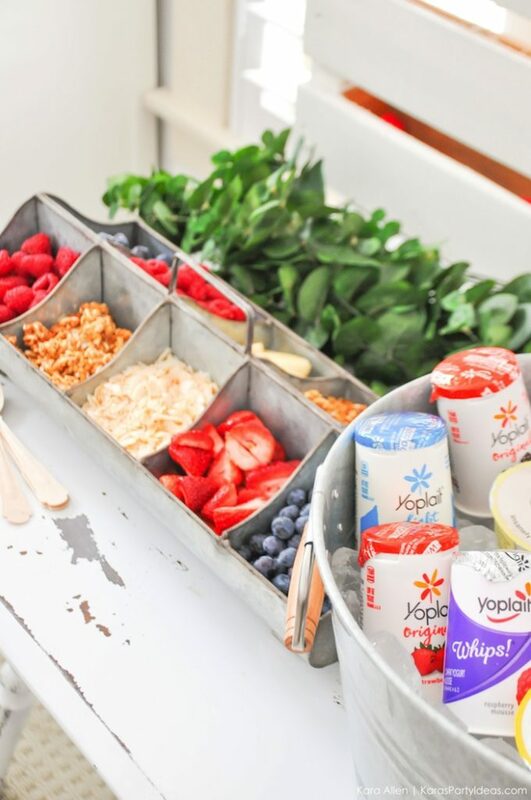 Guests fill their parfait cups with the delicious yogurt of their choice, followed by the fresh fruit toppings and granola. 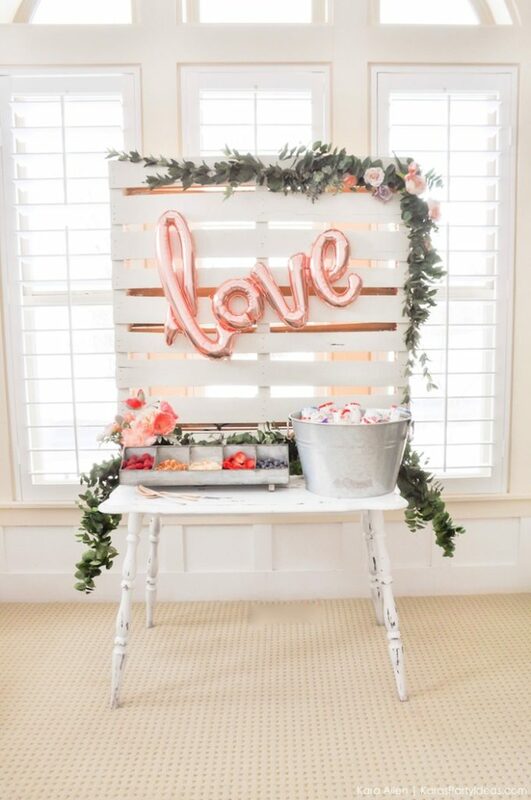 After the wooden pallet was painted white I attached greenery and flowers with thin wire to the upper right corner. 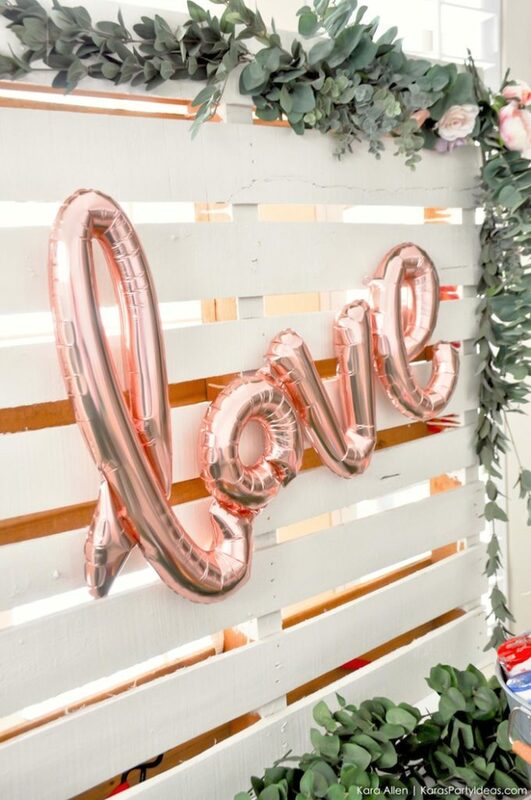 I then hung an adorable ‘love’ balloon on the center of the pallet. 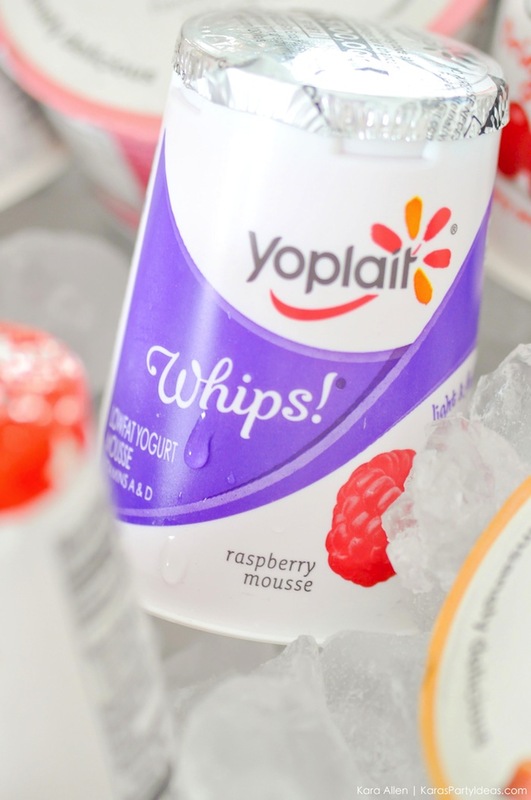 One of the yogurt options I am SO excited about is the new Yoplait Custard! The new yogurt has a spoon-hugging, silky-smooth texture and is available in 6 flavors: Vanilla, Strawberry, Blueberry, Banana, Lemon, Caramel. 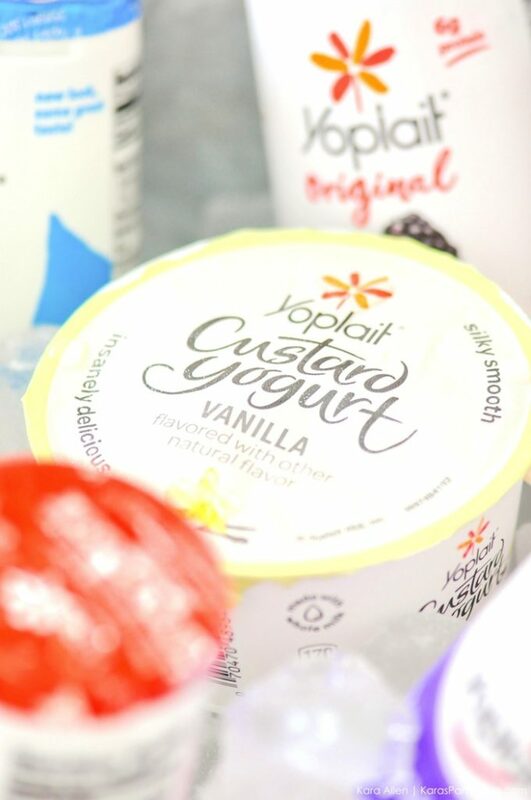 Yoplait Custard is also made with whole milk from cows free of rBGH/rBST growth hormones and has no colors or flavors from artificial sources. It also contains live and active cultures. Yoplait is inviting you all to try all 100+ flavors for a chance to win $100,000! 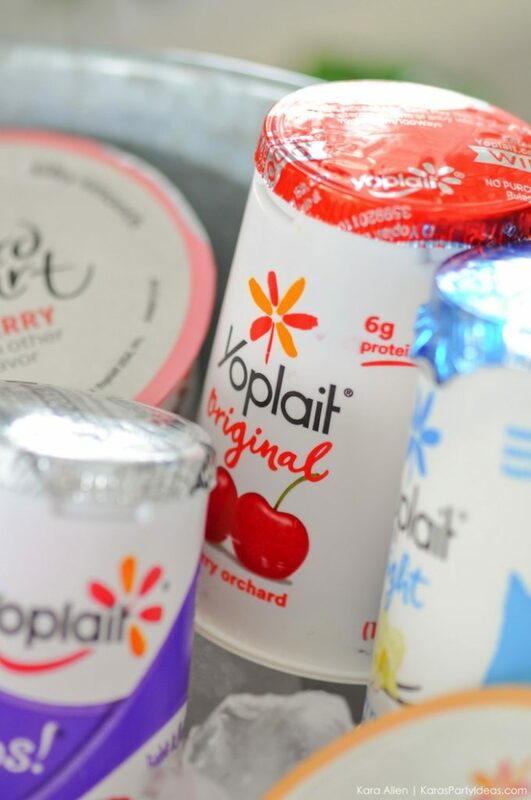 Simply enter the code on top of specially marked lids at Yoplait.com/100Ways and you could win one of more than 3,000 prizes*. 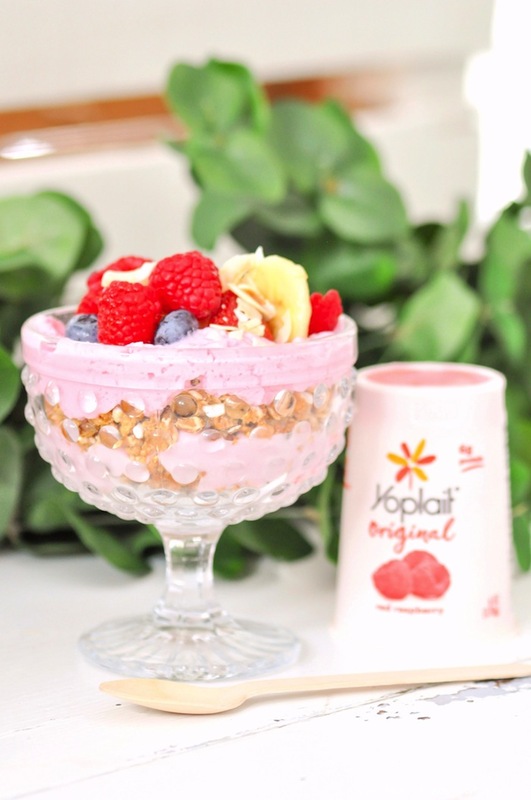 You can find a full list of all of the Yoplait flavors at Yoplait.com/products. *NO PURCHASE NECESSARY. Ends 5/15/17. To play and find Official Rules, visit Yoplait.com/100ways. This post has been sponsored by Yoplait. I may have received compensation in conjunction with this post, however, all views are 100% true and my very own. 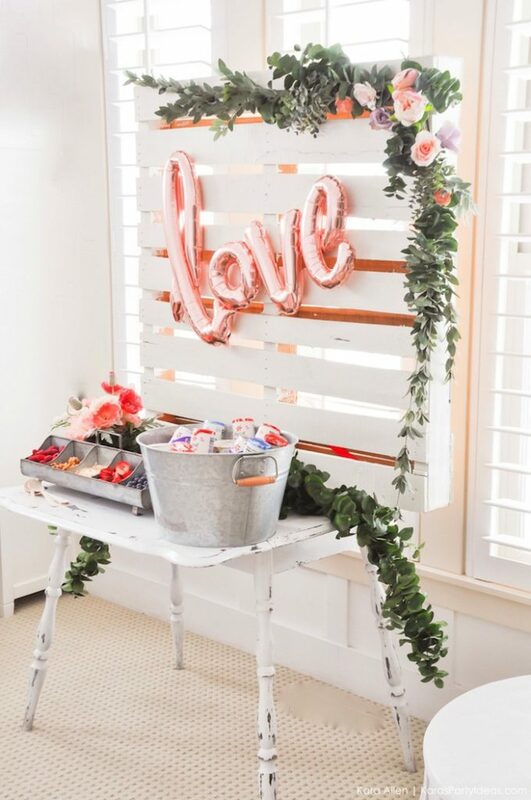 What a fabulous idea for a party! 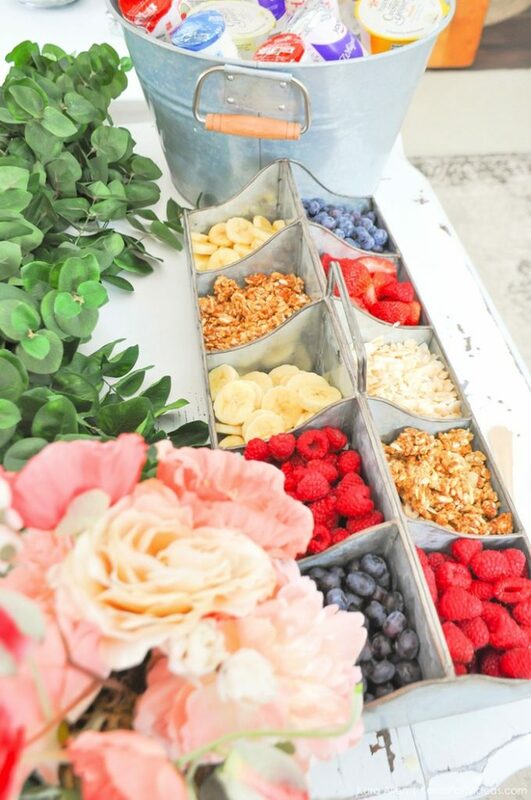 I love the glammed up yogurt bar….everyone loves yogurt and this is a super simple idea–but with a lot of pop! Where did you buy the glasses?! They were purchased a few years ago and have been in Kara’s collection since then. XOXO! Can you tell me where you purchased the metal holders for the toppings? I love it!! They were from Home Goods a few years ago. XOXO! © 2006 - 2019 All Rights Reserved. Designed and Developed by Verisage.